Schnitzel was removed from daily use, insurance and plates discontinued and his restoration officially began. It's sad to throw away original parts, but sometimes they just can't be saved. The running boards and trim on them were original, but far too damaged and beat up to bother with. So in the trash they went, along with the carpet, headliner bits, seat upholstery, padding, body trim and old seals. Then the areas needed to be welded or straightened at the body are marked with masking tape. The rear apron has a few cracks in the metal on the lower right corner that will be welded and fixed. Also there are two broken off tabs in the left side of the engine compartment for holding the firewall in place. Those will be replaced. The rear bumper bracket mount has a few small rust holes and a tiny bent in it, the rocker panel has a broken running board bold left in by a previous owner, the the jack point on this side is bent backwards a bit and under the car the pan edge is bent in a way that blocks a chassis bolt head I will need to get to for body removal. Schnitzel will spend the next few months at the body shop for the minor repairs while I restore all the parts I took off of him before he left. I removed a lot of parts, not as many as I should have but still a LOT. Everything was separated into boxes and labeled. Not too many parts landed in the to be replaced box, but it is always best to save the parts until the restoration is over. 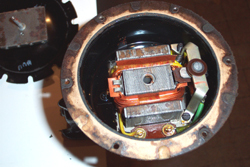 You never know just which part you may not find and have to reuse your old one or you need a reference for installing the new part. Schnitzel's seat frames were completely restored while he was away. The springs were removed from all frames and cleaned. The frames were then all hand sanded to metal (except for the seat bottoms, which I used chemical stripper), primered and then painted with spray paint from Wolfsburg West in the correct color, L471 Stone Beige. A roll around clothes rack makes an excellent painting spot for such parts. Also painted with the same spray were the hand brake handle, steering column, turn signal arm housing, steering column bracket and shifter. 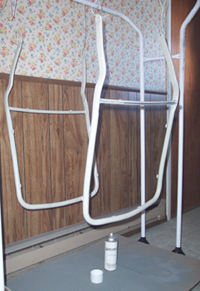 The two front seat frame backs hanging from the clothes rack. The pedal assembly was also disassembled. I always thought this would be more difficult that it was. I have the original VW Bentley Manual for my 1958 Beetle, and it has an excellent section on taking apart the pedal assembly. I painted it with satin black paint and let it dry for long time before I reassembled it and greased it. Meanwhile back at the shop, Schnitzel was getting wrinkles body pulled out. 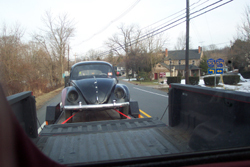 I bought a reproduction Hella horn for my Beetle to pass inspection in New Jersey when my horn died. Then after I dropped off Schnitzel at the repair shop I found an original Bosch horn with screw terminals on eBay for sale. It came off of a late 1957 Beetle, and was said to work. No one was bidding on the crusty thing so I got it for $6.00. I found it quite accidentally as I was not looking for a horn at the moment, I had given up on finding one. The best part of this horn is that all the crust you see on it is really just undercoating that chipped off very quickly and had protected the horn quite well. 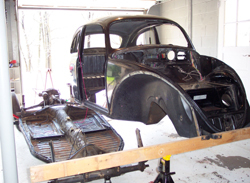 It was virtually rust free! I cleaned and painted all the parts including the ones described above, wrapped them, and piled them in boxes while Schnitzel was busy getting his minor work done. I had just finished the week before he was done and needed more to work on. As soon as Schnitzel was home, I removed his windows, unfortunately breaking his windshield in the process. I took off the cheap aftermarket rusted bumpers, removed the wiring harness and all other miscellaneous parts. 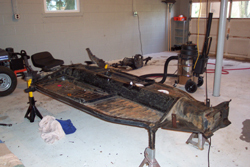 The hood was easily removed with a few bolts, and the fenders with bolts as well. I have almost all of my original fender bolts, Kamax 5D bolts. These are unusual since the head is 14mm with a 8mm thread, the standard has since been set at 13mm with an 8mm thread and so these bolts are no longer available. I had soaked all the body bolts since November with Gibbs Penetrating Oil. This is amazing stuff, not a single bolt soaked with it on the Beetle gave any trouble. 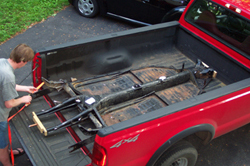 I crawled under the car and removed all the body bolts with a rachet or a breaker bar easily.Then I reinstalled the junk bumper brackets and we used these as the lifting points for the body removal. The body is quite light with everything removed. 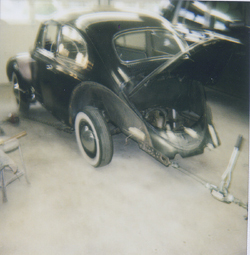 Now I am focusing on the pan and its components, the body will sit while the pan is restored. Every usable bolt has been degreased, stripped of remaining paint, soaked in POR-15 Metal Ready to remove any rust and etch the metal, then cleaned with water and painted satin black and put in a labeled zip lock bag. 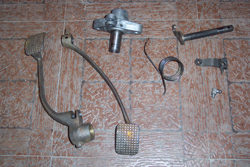 Bolts that cannot be reused, such as some of the body bolts were purchased from Wolfsburg West. 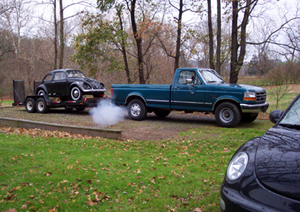 All new German brake parts and Boge shocks were purchased also, my Beetle uses the wheel cylinders and smaller brake shoes that were used from 1954 until 1957 (including very early 1958 model Beetles). Both front drums are original and dated August 9th, 1957 but the right one has ball bearings and the left one roller bearings. 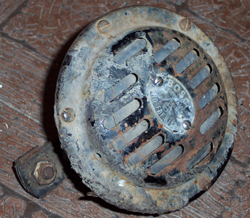 The rear drums are also original and both dated July 15th 1957.